Peonies and Delphinium, oh my! Blossom Hill Nursery is a stunning garden just outside of Peterborough in Fowler’s Corners that even many locals don’t know about! Filled with one of the largest collections of peonies and delphinium in Ontario, gardeners and photographers alike fall in love with this place as soon as they arrive. Joe and Hazel Cook have been members of Peterborough and Area Garden Route since its inception and are experts in their field presenting at many horticultural societies as well as Delphinium and Peony societies across North America. 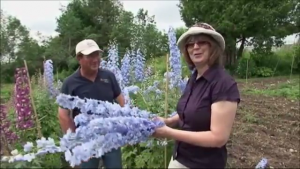 Watch this episode of The Garden Gate where we visit the nursery to see the gorgeous delphinium blooms.